A very different book on cacti and succulents looks at how cacti and succulents work . These scientific studies are presnted in terms understandable to the layman and many interesting ideas bearing on the cultivation of cacti and succulents can be gleaned. 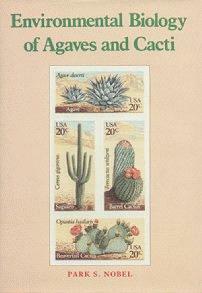 The first chapter discusses the uses of cacti and agaves and their morphology and anatomy. The second chapter discusses gas exchange and the unusual photsynthetic strategies that these plants have adopted. Chapter three looks at how the plants handle water storage and usage. Chapter four looks at the plants strategies for dealing with temperature extremes. Chapter five looks at the effects of light (Photosynthetically Active Radiation). Chapter six includes studies on nutrient levels for cacti and agaves and the last chapter studies productivity. If you want to understand more about the way cacti and succulents work this is the book for you.